Warner Leisure Hotels, Alvaston Hall is a Grade II listed Victorian Property set in the Cheshire Countryside. The grand country house, which has recently been awarded four stars, is popular amongst its guests who visit the hotel for its stunning, elegant setting along with the vast range of facilities it provides. The hotel offers a 9-hole golf course, spa and beauty treatments, great food and an excellent range of entertainment, including an impressive cabaret restaurant. The restaurant kitchen required an upgrade due to the existing vinyl floor which kept failing and lifting. Vinyl can become slippery and ensuring that the Warner team are kept safe and secure when working is imperative to the company. The hotel had previously used resin flooring, but due to cracking the decision was made to cover with vinyl to meet hygiene standards. 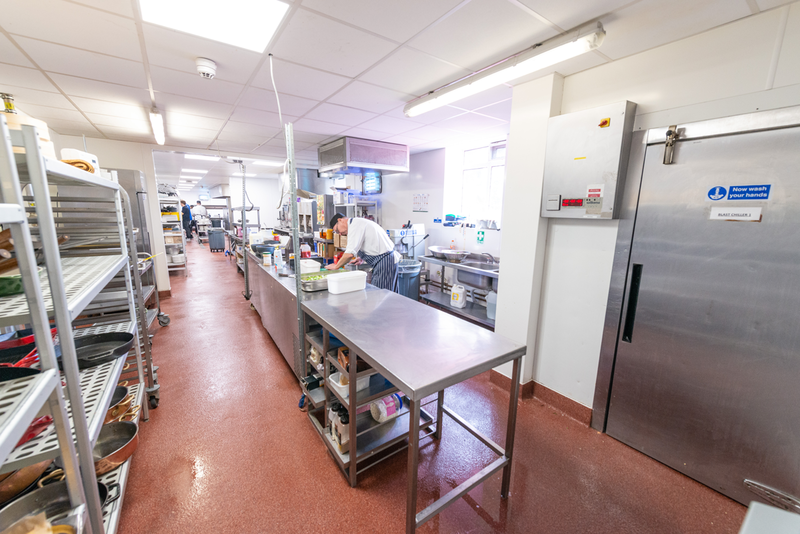 The kitchen, which is consistently busy all year round, could not close and completing a refurbishment was going to be particularly challenging. A programme had to be devised in which the kitchen could remain operational throughout. The installation, which included 233m2 of floor and 162lm of coved skirting, was completed over three phases, with the preparation being completed during the days and the resin installation overnight. To keep the kitchen functioning equipment was rotated around the room to allow the areas of the floor to be completed on a rolling programme. There were concerns regarding the quality of the existing resin floor which appeared to be breaking in several areas under the vinyl. The National Flooring Company were equipped to remove any defective resin and replace with Degafloor’s fast curing repair mortar. The product cures exceptionally quickly with a high compressive strength, allowing the resin floor to be installed directly on top within just a couple of hours. The client had requested a hygienic and slip resistant floor and following the initial consultation it was agreed the Degafloor QTA system would provide the ideal solution. The system, which is seamless leaves nowhere for bacteria to breed and the aggregate scattered in to the system provides a hygienic and slip resistant floor finish that remains above the HSE recommended levels even in production conditions. Although the project was challenging and had limitations in terms of the working programme the works were delivered on time and to the satisfaction of the hotel who were able to continue operating without impacting on their guests.